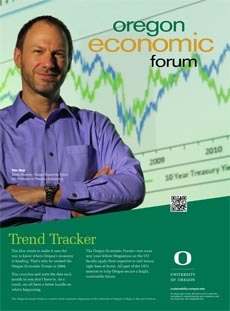 Click here for newsletter version. The labor market retained sufficient strength to convince Powell & Co. to stick with the current policy path. 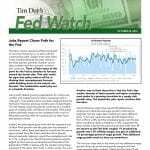 Expect more rates hikes in the months ahead as the early reads on the third quarter, primarily October survey data, indicate that the economic momentum continues. There is little reason at this point for the Fed to abandon its forecast toward the dovish side. That said, watch for signs that policy makers will be rethinking their unemployment forecast while doubling down on the natural rate forecast. The combination would play out in a hawkish direction. Job growth defied growing expectations for a blow-out number and instead came in below consensus with a 134k gain. The headline print was likely weighed down by Hurricane Florence; previous months were revised higher. 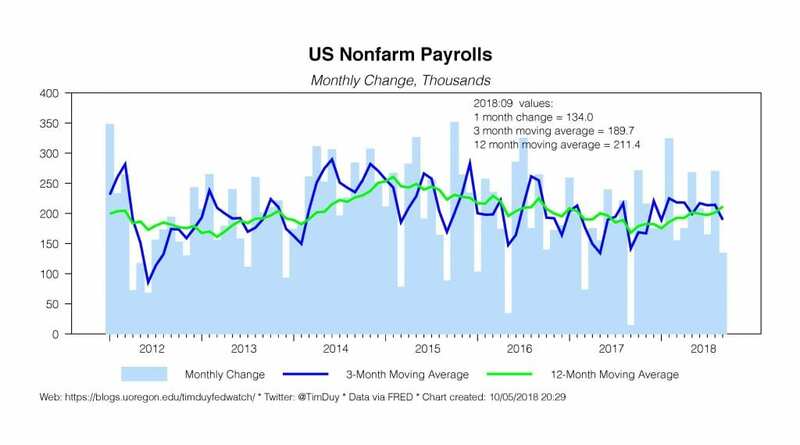 The net impact is that job growth continues at a monthly pace of roughly 200k, well above the roughly 100k policy makers generally expect to be consistent with a non-inflationary economy after the cyclical pull on labor force participation wanes. 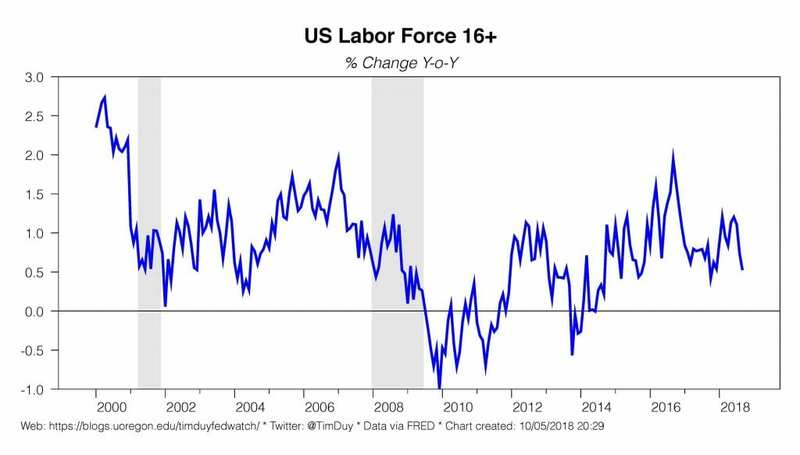 Indeed, the jobs report gives hints that the surprise burst of labor force growth over the past year has reached a conclusion. 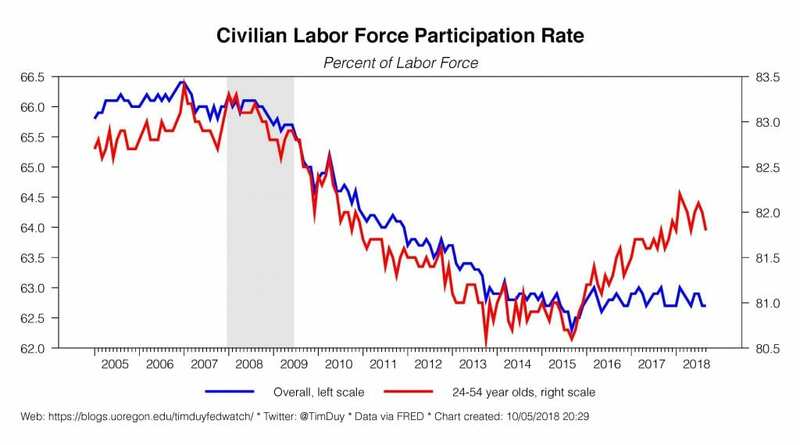 Labor force participation overall and for prime ages workers have flat-lined, and labor force growth slowed markedly, helping to push the unemployment rate to 3.7%, a 48-year low. Recall that policymakers recently edged up their year-end unemployment forecast at the September FOMC meeting with the median policymaker expected 3.7% rather than 3.6%. In other words, the economy is at the Fed’s target well ahead of schedule and the pace of labor force growth versus job growth looks likely to push the unemployment rate down below their target. Another way to think about this is that the Fed’s September forecast of faster growth and higher unemployment spoke to a growing conviction in a supply side growth story. The September jobs report weakens that narrative. 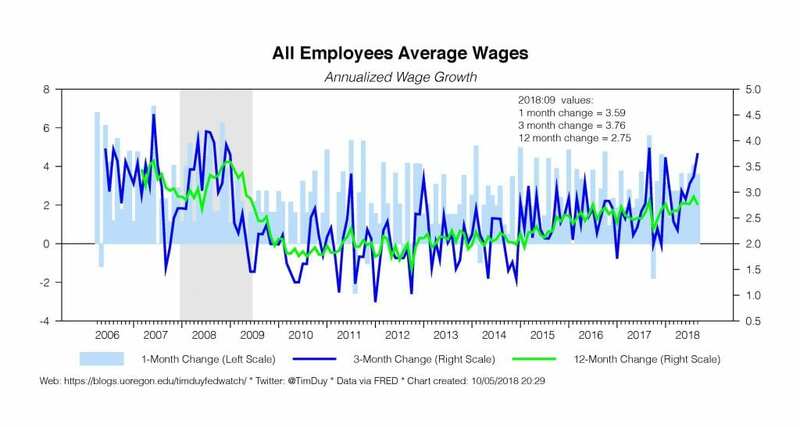 Central bankers might have waved off additional unemployment declines had wage growth continued to stagnate, but the wage data is starting to tell a different story. To be sure, year-over-year growth edged down from 2.9% to 2.8%, but the annualized pace over the last three months has been a healthier 3.76%. Supposed the labor market sustains that pace and do that math here: If we assume as the Fed does roughly 1% productivity growth and a 2% inflation target, you get an additional .76 percentage points of wage growth. That additional wage growth needs to show up somewhere. The Fed can hope that in the short-run the additional wage growth shows up as narrowing profit margins and real wage gains for labor. Indeed, I think that the Fed will risk this scenario as long as possible and not accelerate the pace of tightening – as long as inflation stays low. But obviously if inflation instead looks to be heading above 2.5% on a sustainable basis, they will be looking to engineer a slower economy via a faster pace of rate hikes or via signaling that they anticipate a higher terminal rate. 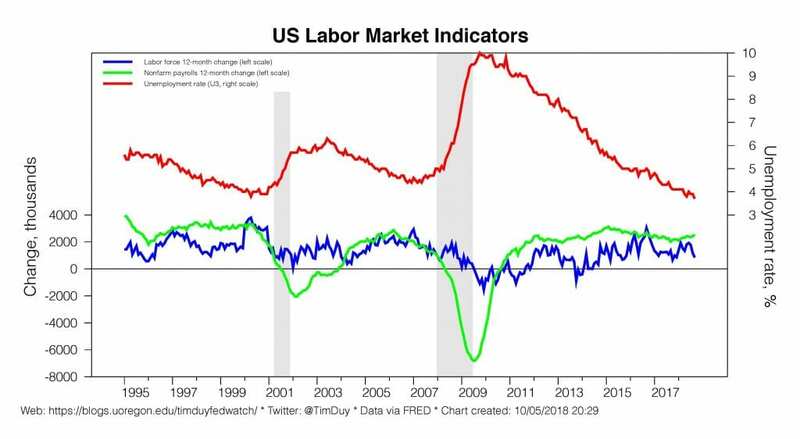 Keep an eye on the forward-looking indicators employment – they suggest the labor market isn’t loosening momentum anytime soon. Not only are initial unemployment claims holding at ultra-low levels, but temporary employment continues to rise. Both suggest job growth will hold strong. 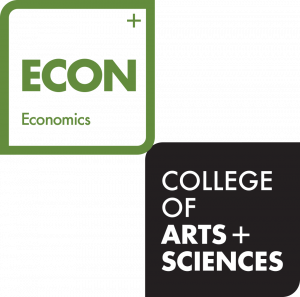 The incoming economic data on the real side of the economy have come in stronger than I had been expecting earlier this year. 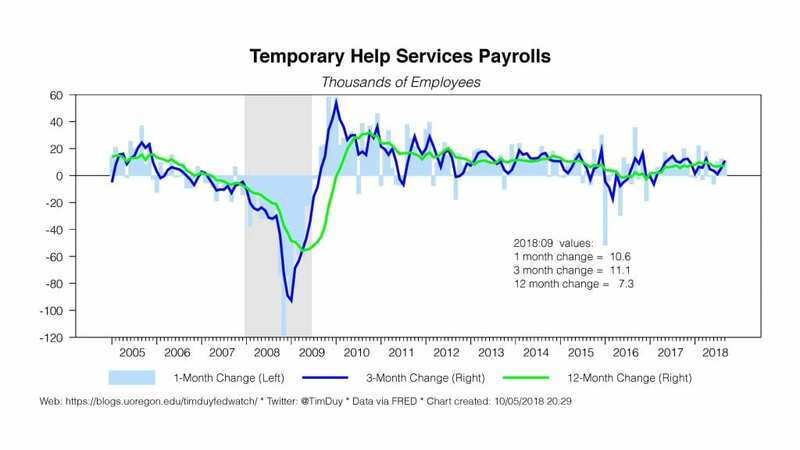 So much stronger, in fact, that the central question in my mind is whether the apparent strength in GDP and job growth is a signal that I have materially underestimated the underlying momentum of aggregate demand. If that’s the case, the potential for overheating would require a higher path for rates than what I had been thinking. …there was a marked uptick in the reported ability of firms to pass on cost increases. This was especially true for firms subject to tariff- and freight-related cost increases. Those firms reported little to no pushback when passing along rising costs to their customers. But I get the sense that the phenomenon is becoming more widespread. It’s a development that I will continue to watch closely. Current conditions suggest, to me, that we ought to get to a policy stance where our foot is neither on the gas pedal—what we call an accommodative policy—nor on the brakes—what we call a restrictive policy. Such a neutral policy position would allow the economy to stand on its own. It is unclear if Bostic means moving faster to neutral than expected, or that neutral is higher than he excepted, or both. A “higher rate path” could be interpreted in any of these ways. But, at a minimum, it suggests upward drift of low dots toward the median, or, in other words, a growing confidence in the median rate hike projection. Also note Bostic’s perception that firms can more easily push through prices to customers. If these concerns grow, it sounds likely he could be easily pushed into thinking that rates need not only to get to neutral, but beyond to restrictive. Bottom Line: Incoming data continues to support the Fed’s basic forecast that rates need to climb higher. I think the data increasingly supports the case that rates need to move in a restrictive zone before the Fed can breathe easier, but much depends on the evolution of the inflation data. A hint that inflation could be sustainable higher than 2.5% would probably embolden central bankers to take more aggressive action.